Goats have been supplying us humans with delicious milk for millennia. As free-range grazers, they search for the best grasses and herbs – because when it comes to food, goats are picky. They prefer to pluck only the tops of the grasses and eat fresh leaves, and they love to nibble bark. 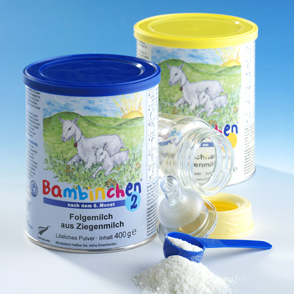 The milk used for Bambinchen and the Golden Goat full-cream goat’s milk powder comes predominantly from white Saanen goats: an old breed of dairy goat, which has spread from Switzerland to the rest of the world. New Zealand’s lush green meadows are ideal feeding grounds for them. Goat’s milk is an excellent basis for baby food, as it is formed in the goat’s udder (apocrine secretion, similar to human breast milk). Milk formed in a cow’s udder follows a merocrine secretion process. Goat’s milk contains more short and medium-chained fatty acids than cow’s milk. These are easier for the body to absorb than long chains, and therefore better digested. The fat globules in goat’s milk are smaller than those found in cow’s milk. They result in a larger total surface area, enabling enzymes to break them down better, which in turn further improves digestibility. Many people with sensitive stomachs love goat’s milk. Six of the ten essential amino acids humans require through food intake are more commonly found in goat’s milk than cow’s milk. αS1 casein (casein fraction) and β-lactoglobulin (whey protein) in particular are two proteins known to trigger allergic reactions. Goat’s milk contains considerably less αS1 casein and β-lactoglobulin than cow’s milk. Its high content of free peptides and amino acids compared to cow’s milk is especially striking. Goat’s milk is pure white, already contains full vitamin A, and hardly any provitamin A (carotene), which is what gives cow’s milk its slightly yellowish colour. Given these benefits, it is only logical to offer baby formula based on goat’s milk. Bambinchen has been sold in Germany since as early as 1993. Goat’s milk while breastfeeding? But OF COURSE! Pregnant women or breastfeeding mothers often feel tired and drained. They require an increased intake of vitamins, minerals and protein. We recommend goat’s milk and – for those wanting to give their body an added boost – organic spirulina microalgae. Our GOLDEN GOAT goat’s milk powder is rich in top-quality proteins high in essential amino acids. Goat’s milk also contains a high volume of medium-chain and polyunsaturated fatty acids, which are considered particularly valuable in human diets as they protect the heart and vessels. And all the while, your baby will be receiving the best of nourishment! GOLDEN GOAT – all the positive properties of goat’s milk for mother AND child!